Margaret writes to Jessie about travel plans and asks her to help a friend find a place to teach. I'm so glad that you and Frank are going to be at Cornish. In three weeks and two days I shall be with you unless you are cruel enough to run off to Laborador. Please don't go. I need you.Mr David arrives in Cornish on the third of August, so of course I have to be there to study with him as I enticed him there. There is one serious difficulty in connection with his teaching there which I want you and Frank to help him out of. You see if Mother had been well by now I should have been in the mountains by this time and with the family in Cornish by the middle of July. Between that time and the third of August I was going to find Mr David some empty barn or something to teach in. Now will you and Frank please for my sake look for something? This is the best way to go about it. Go first to see Miss Preble, fromour hostess at the Turn Pike Inn where Mr David is going to stay; tell her that we, Mother and I (and you if you wish) are intensely interested in finding a place for Mr David to teach in. Then perhaps she will hustle around and help you all to find such a place. Any empty barn within a radius of a mile of the Turn Pike Inn would be all right. He wouldn't mind walking a nice mile a day. You see the matter is fearfully important for if he is not assured of a place to teach in hbefore he comes to Cornish he will have to give up coming, for I am not going to be his only pupil there and, though he could teach me at Harlakenden, he cannot off and go to Cornish for one pupil. He can stay in Eaglesmere and have ten pupils a day. I hate to bother you dears, especially as you haven't the automobile to go around in but I just have to. Oh I do hope that you are not going to Laborador. I long to see you both. It was a delight to see Frank in Chicago. He was kind to come and see me. I sho' am crazy about him. The Davies were charmed by him. I want to hear all about Eaglesmere. Why didn't you mention it in your letter to Mother? Don't forget all about it before I see you. Dearest Jetty I do love and admire you so much,—and I am so homesick for you! Please don't go away. Give my deepest love to Frank. 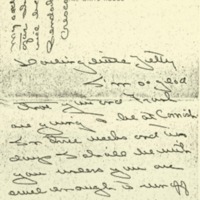 Wilson, Margaret Woodrow, 1886-1944, “Margaret Woodrow Wilson to Jessie Woodrow Wilson Sayre,” 1914 July 6, WWP17489, Jessie Wilson Sayre Correspondence, Woodrow Wilson Presidential Library & Museum, Staunton, Virginia.